...something borrowed, something blue. Most brides insist on carrying out this good luck saying for their wedding. 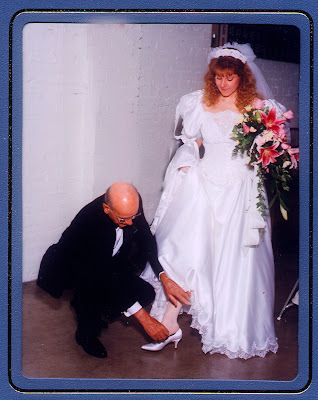 I know with my wedding, my something old was a handkerchief from my late grandmother, my something new was my dress, something borrowed were my mother's pearls, and something blue was my garter. Pretty standard fare for fulfilling this saying that can be a bit superstitious...if a bride has all four on her wedding day, it's sure to be a happy marriage! Hey, it can't hurt! Something Old symbolizes continuity with the bride's family and the past. It's probably the most difficult part of this saying...most brides want something old from their family or heritage. Ask family members to help you find something meaningful to you. Wear your mother's wedding dress or a vintage dress or use a piece of it as antique lace on your headpiece or in the bouquets. Use heirloom rings for your wedding rings. Something New means optimism and hope for the bride's new life ahead and creating a new union with her husband. This one is easy! And of course, we can help you out with this one at TJ Formal. Shoes are a great choice for something new, as is Jewelry. A new perfume or makeup purchased especially just for the wedding would also qualify. Something Borrowed is usually an item from a happily married friend or family member, whose good fortune in marriage is supposed to carry over to the new bride. The borrowed item also reminds the bride that she can depend on her friends and family. The easiest thing to do is to ask a dear friend, especially if she is your bridesmaid! The item must be returned after the wedding, or it wouldn't be "borrowed." A significant piece of jewelry from a friend/family member, such as a necklace she always wears, or handbag used at her own wedding would be ideal. Something Blue - blue has been connected to weddings and love for centuries. It symbolizes love, modesty, and fertility. This might be a little more difficult if your color scheme doesn't have blue in it. There is always the tried and true garter since that doesn't show. But you could also tuck in something blue - like a charm or hanky - into your bouquet. How about having one secret blue flower hidden in there? Or a blue jewel attached to your headpiece? And did you know this saying has a 5th line? "And a silver sixpence in her shoe." Thanks for the info! I have always wondered about the meaning behind this tradition.